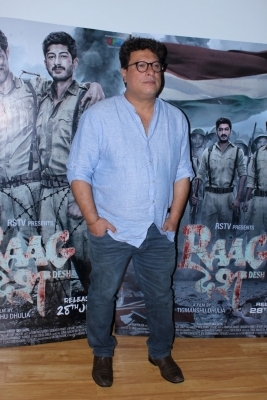 Mumbai, July 23 (IANS) Filmmaker Tigmanshu Dhulia had a tough time casting actors for his forthcoming film “Raagdesh” as he says that iconic stars don’t do justice to real-life characters. Dhulia, whose last directorial project “Bullett Raja” was released four years ago, says it was not easy for him to cast three faces to play the INA soldiers in “Raagdesh”. He finally zeroed in on actors Kunal Kapoor, Mohit Marwah and Amit Sadh. “It was very important not to cast known stars as these real-life soldiers from Subhas Chandra Bose’s army. I firmly believe iconic stars do not do not justice to real-life characters,” Dhulia said. For the role of Subhas Chandra Bose, Tigmanshu has roped in Assamese actor Kenny Basumatary. “He was already working with me in my other film while I was looking for an actor to play Subhas Chandra Bose. I suddenly realised Kenny has a striking resemblance to Bose,” he added. “Raagdesh”, is a film that salutes the heroes of the Indian National Army. It revolves round the Red Fort trial of the three INA officers. It will be specially screened for the President at Rashtrapati Bhavan. “Raagdesh” is slated to release on July 28.